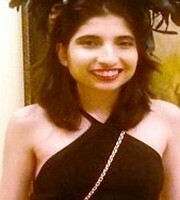 Anum Sattar is a sophomore studying English at the Collegeof Wooster in Ohio, USA. Her poems have been publishedin various literary journals. She won the third VonnaHicks Award at the college. Whenever possible, she readsout her work at Brooklyn Poets in New York City. out her work at Brooklyn Poets in New York City.